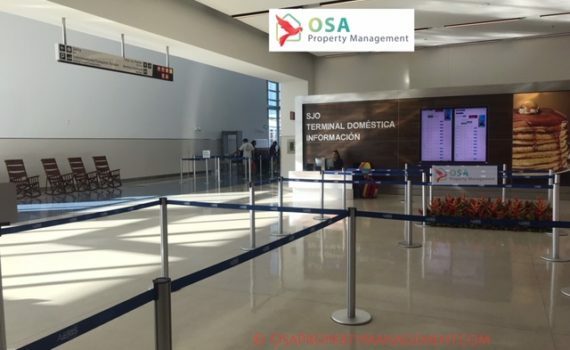 Costa Rica's Domestic Airport terminal received a substantial upgrade in mid-2018. The new modern design is sleek, airy, and bright with improved traveler amenities, including mobile charging stations and a well-provisioned convenience store. The open, streamlined layout of the new Costa Rica domestic airport terminal is visible before you pass through the doors, and a gorgeous, contemporary bronze sculpture accents the glass-paned entrance. Once inside, the crisp, minimalist styling is soothing on the traveler's nerves. Everything is well-marked, and signs are bright with large print, making information easy to read and locations easy to find. Airport staff, as always, are cheerful, friendly, and committed to customer service. 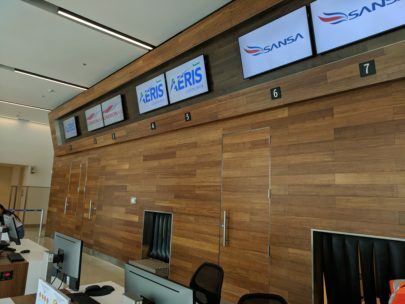 Domestic flights are available through Sansa Airlines, with service to 14 destinations across Costa Rica, and Carmonair Charters, with service to nearly 40 stops nationwide. 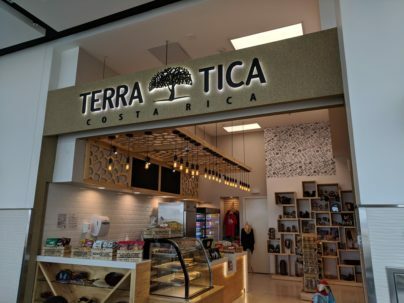 Terra Tica, the shop located beside the gate seating area, offers a wide variety of refreshments, including fresh bakery items, cold drinks, and high-energy snacks. You'll also find an assortment of locally crafted goods and vacation souvenirs. 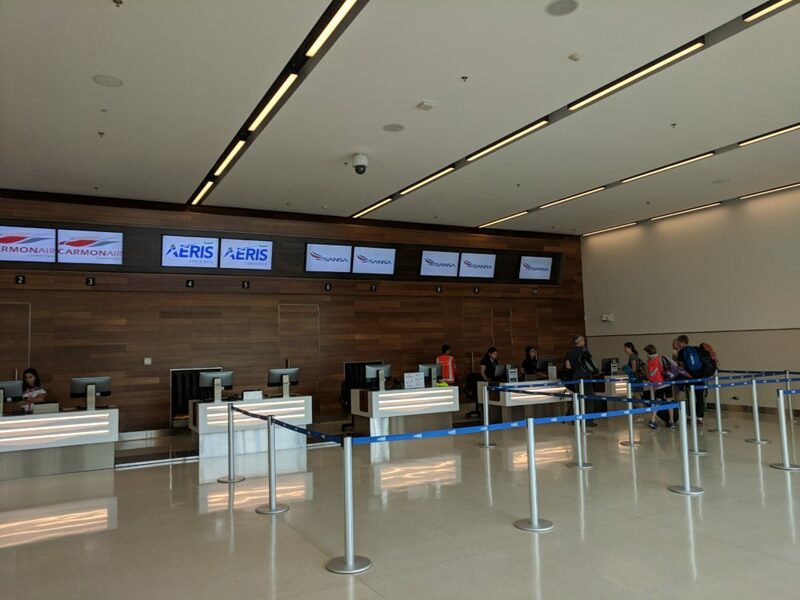 The gates are well-lit and airy, with accessible seating and charging stations throughout ensuring your mobile device and/or laptop are fully charged prior to boarding. The tarmac is visible through floor-to-ceiling windows which span the length of the building providing natural lighting and great views while waiting to board your flight. As with the previous Costa Rica domestic airport terminal, travelers walk out to their plane. There are now many safety improvements including well marked walking paths, high-visibility vests worn by employees to guide travelers to the correct plane and easier access, including ramps. 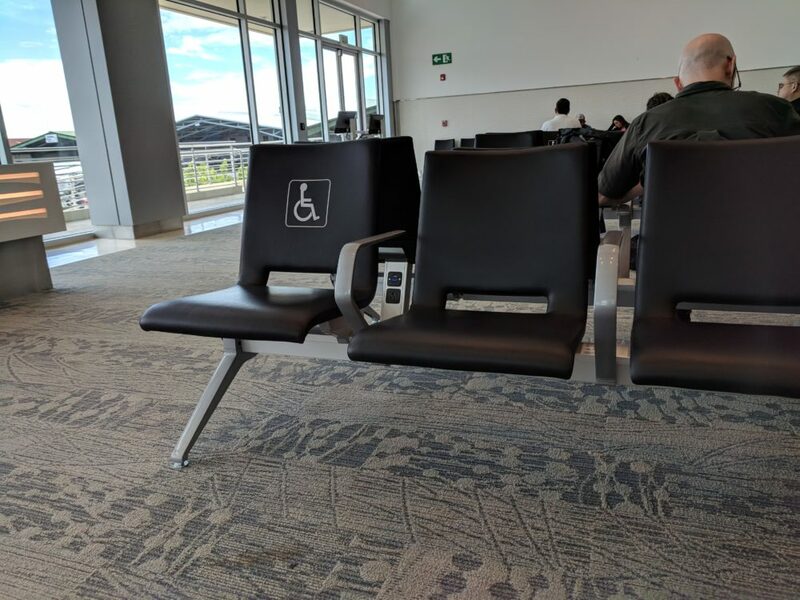 For those returning to San Jose at the end of their trip, enhanced accessibility and clearly-marked points of entrance alleviate passengers' doubts about where they need to go when they deplane. A roundabout in front of the terminal provides easy access to taxis and shuttles, and San Jose's Juan Santamaria's main terminal is but a short walking distance. Baggage handlers greet travelers at the entrance, and a central information desk is located across from the ticketing counters for travel or locale-related questions. Updates are being made to regional terminals and airstrips as well, including San Isidro and Palmar Sur. For the most updated information on travel within Costa Rica, please contact us by phone or email, and be sure to check us out on YouTube. We recently visited the Palmar Sur Airport Remodel project currently taking place at this popular airport for travelers vising the Osa Peninsula and nearby towns of Sierpe, Chontales, San Buenas, Ojochal, Uvita and Dominical. 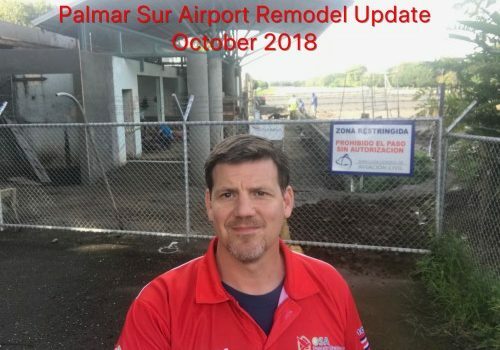 The following video provides an update and some great information about the Palmar Sur Airport remodel. Click on the photo below to watch or view it on our YouTube Channel. 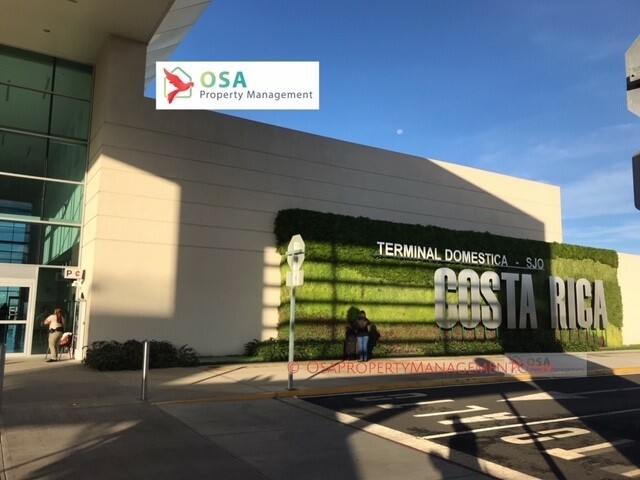 As mentioned in the video, everyone here at Osa Property Management is hoping that the airport is completed with the remodel by the end of calendar year 2018. We are recommending to our scheduled guests to have a back-up plan in place if their plans include arriving into San Jose's Juan Santamaria's airport first, and planning on flying down to Palmar Sur. We can help with securing a car rental in San Jose, or hiring a private shuttle for you and your travel companions. Once the Palmar Sur Airport Remodel is completed, this regional airport will be one of the nicest in the country. Palmar Sur serves travelers from Sierpe, Rio Claro, Chontales, San Buenas, Ojochal, Uvita and Dominical. In August 28, 2018, we visited Palmar Sur regional airport to get an update on the construction project there. The following is our Palmar Sur Airport Update. In early August 2018, we had a client who had a scheduled flight from San Jose to Palmar Sur, via Sansa airlines. They were planning on a weeklong vacation at Casa Lapas. 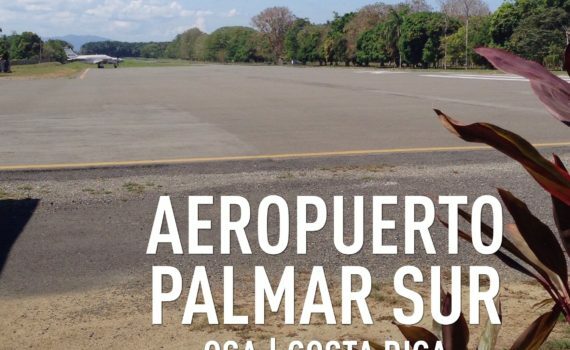 Approximately 24 hours prior to the clients' departure, they were notified that the Palmar Sur airport was close and no other information was available. After scrambling to get the clients rescheduled to Perez Zeledon's regional airport, we decided to investigate what was going on. Below are a couple of videos that provide how the Palmar Sur Airport Update will improve traveling to the southern pacific zone of Costa Rica in the not-to-distant future. Here is a list of the changes taking place at Palmar Sur airport. All of these changes are scheduled to be completed in four months - with a goal of being completed by January 2019. Existing terminal is going to be increased in size from 750 square feet to over 5,000 square feet. It is still unclear whether or not the existing terminal structure will be kept or if it will be torn down. One of the goals of the increased width of the runway is to allow more models of aircrafts to be able to make emergency landings if necessary. Palmar Sur is relatively safe compared to other airports in the area due to the flat topography and ease of landing for planes coming in from the west/Pacific Ocean side. 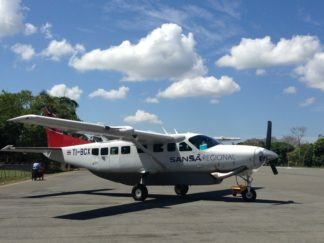 Sansa airplane at Palmar Sur airport (when the airport was operating). The Palmar Sur airport is scheduled to reopen in early 2019.